Alonso talks about her approach to learning lead roles (such as Giselle) from observing steps, entrances, and exits while in the corps de ballet (chorus). She discusses her "famous year" in bed, rehearsing steps on her fingers from memory. Alonso also mentions juggling 3-4 ballet performance a night, while also rehearsing for the role of Giselle during the day. Born in Havana in 1921, Alonso began her ballet training in Cuba and continued it in New York City with Anatole Vilzak and the School of American Ballet. She joined the corps of the American Ballet Theatre (ABT) in 1940 and was promoted to ballerina two years later. She danced regularly with Igor Youskevitch in productions by George Balanchine. She maintained her affiliation with ABT until 1960, but also performed regularly with other companies, including the Ballet Russe de Monte Carlo. In 1948 she founded her own company, Alicia Alonso Ballet Company which was later renamed Ballet Nacional de Cuba. At the time of this interview she was the director and prima ballerina of Ballet Nacional de Cuba. Now, well into her nineties, Alonso continues to direct the ballet company. 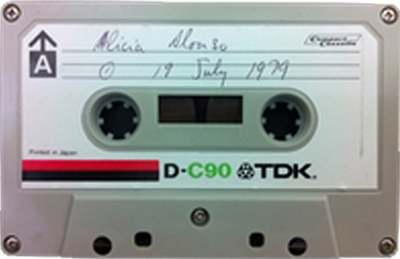 “Alicia Alonso (published 1982),” Dance Dialogues: Interviews by Barbara Newman, 1979-Present, accessed April 25, 2019, http://dancedialogues.prattsils.org/items/show/13.